DETROIT -- A former deputy chief of staff said Rep. John Conyers made an unwanted sexual advance toward her and touched her inappropriately twice in the late 1990s, the Detroit News reported Tuesday, in the latest sexual misconduct allegations against the veteran lawmaker. Deanna Maher, 77, who ran a Michigan office for Conyers from 1997 to 2005, told The Detroit News that there were three instances of inappropriate conduct. Conyers' attorney Arnold Reed told the newspaper that he questioned why Maher would work for Conyers for so many years after the alleged allegations. He said her allegations are uncorroborated and Conyers denies wrongdoing. "He maintains that he has not done anything wrong," Reed said. Maher said she didn't report the harassment because Conyers is a powerful man in Washington and she didn't think it would be taken seriously. Former Detroit Free Press reporter Joel Thurtell said Monday that Maher told him about the alleged misconduct at the time but didn't want to go on the record and he didn't report it. Maher also discussed the incidents with a Detroit News reporter in 2013 but didn't want to go on the record. The House Ethics Committee has launched an investigation of Conyers and he said Sunday he would step aside as the top Democrat on the House Judiciary Committee, after a news website reported last week that Conyers settled a complaint in 2015 from a woman staffer who alleged she was fired because she rejected his sexual advances. 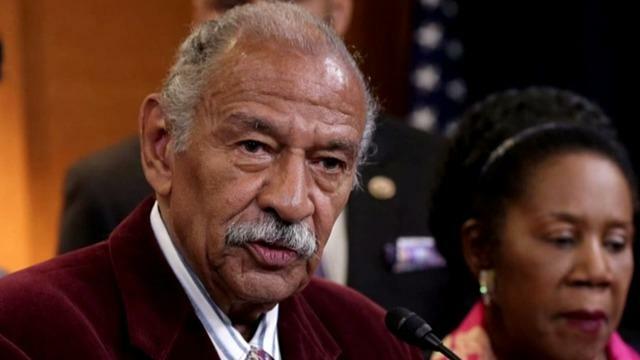 Conyers, 88, confirmed his office settled a harassment complaint involving a former staffer but denied the allegations. Last week, Melanie Sloan, a high-profile Washington lawyer, said Conyers verbally abused her repeatedly when she worked for him. Sloan says while she was not sexually harassed when she worked for Conyers, he would often berate her and criticize her appearance, reported CBS News' Nancy Cordes. She said his actions went beyond being just a tough boss. "He screamed at me in front of a bunch of domestic violence advocates," Sloan said. Sloan worked for Conyers from 1995 to 1998 as a House Judiciary Committee staffer. Sloan said Conyers was constantly verbally abusive. "He would yell and scream at me. There was a time where he screamed at me for not wearing stockings," she said.